Hinderclay is a village in the Mid Suffolk. The village is located around 14 miles from Bury St Edmunds in an area of rolling arable land to the south of the Little Ouse river valley. Neighbouring villages include Thelnetham and Rickinghall. In 2005 its population was 340. The parish also contains the hamlet of Thorpe Street. The parish church is dedicated to St Mary and was thatched until 1842. Hinderclay Hall is to the south of the village. A tower mill used to stand in The Street. It was demolished either in 1920 or 1955. Two pubs used to exist in the village. First, the Bell (formerly Six Bells) The old pub was also located close to a bend in the road still known locally as 'Bells Corner' and secondly, the Crown. Nearby, on the edge of Hinderclay wood, were found the remains of an early Iron Age settlement. Roman pottery kilns were found in the wood. 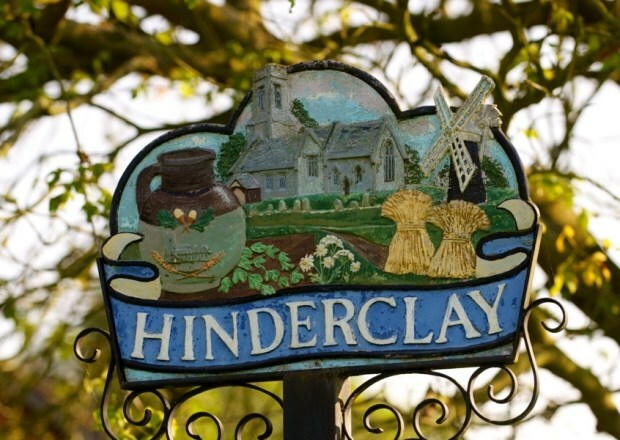 The village was recorded in Domesday as "Hilderclea" (from the Anglo-Saxon for "tongue of land in a river where the elder grew").